CRAVE has had some serious IT issues, which have made it difficult to keep up with things – apologies. Following on from my last post, saying that I’d been surprised by purchasing a cute 1959 Fender Musicmaster. Well, that trend of ‘leftfield’ acquisitions has continued into spring 2015. At first glance, these new old guitars may seem inconsistent with CRAVE’s philosophy but bear with me – “though this be madness, yet there is method in’t” as a certain Brit Bard wrote in Hamlet. Methinks, he would have been a wicked guitarist. 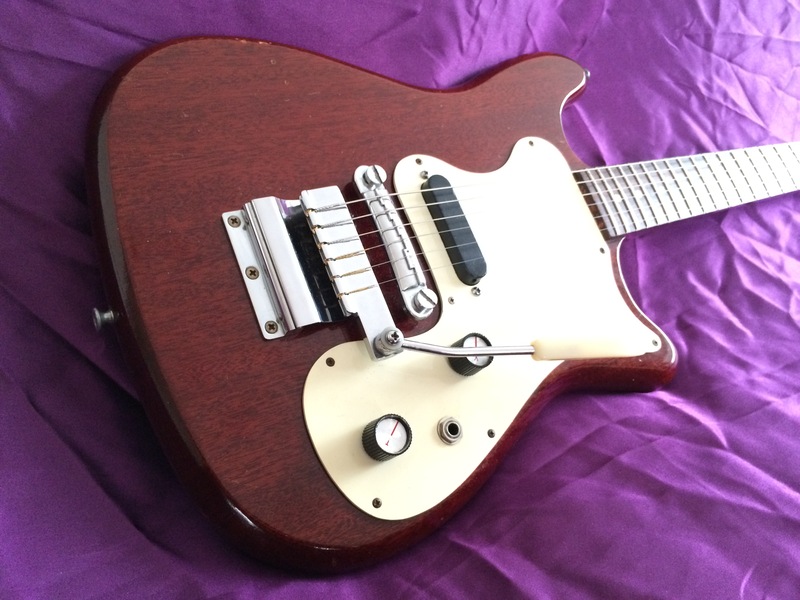 The first recent purchase is a really nice original 1976 Music Man Stingray I purchased from Ross Godfrey, founder and guitarist of Morcheeba, who bought it from its original owner in New Mexico. I used to work for the importer of Music Man in the late ‘70s (Strings & Things) and the 1978 Stingray bass that I still own came from there, so they make a good pairing. This Stingray is a lovely all-original early example with the white pickguard and retro knobs. The Stingray, designed and built by Leo Fender at Music Man after his 10-year post-CBS exile from the industry, showed where his prolific innovations in guitar design were going at the time. Sadly, for a number of reasons, the guitar didn’t survive into the Ernie Ball era like the bass did. However, in my opinion, it is a greatly underrated and underappreciated guitar. While some critics jump on the bandwagon of knocking it simply for the sake of it, perhaps it is time to re-evaluate it on its merits, which are many. They have a lot going for them and there is a lot of virtue in conserving these cult models for posterity. The connection between this guitar and Fender is therefore strong and credible. In my opinion, the MM represents a different and really cool instrument (and a relatively rare one – only 500 of these early examples were made). The second recent purchase is a really cool 1966 Epiphone Olympic in lovely condition. Epis at that time were made by Gibson and, while some other models were Gibson clones, this particular Olympic has all the key hallmarks of Epiphone’s independent early ‘60s design. I imported this one from Canada and it had to have a little bit of respectful restoration to the electrics on arrival (thanks to Dave at Eternal Guitars). Now it’s in perfect order, just as it should be. Taking all costs into consideration, I’m unlikely ever to make any profit on the Epi but that’s not the point of CRAVE Guitars. It is a lovely little vintage instrument, very light, beautifully made, easy to play and the single, often belittled and misunderstood, ‘60s Gibson Melody Maker pickup sounds great. As you may have noticed by now, CRAVE really likes stripped down back-to-basics guitars that the snobs (thankfully) tend to bypass. Dig that neat ‘batwing’ headstock too, SO cool. This Olympic model is undeservedly overlooked by collectors in favour of the Epiphone Coronet, Crestwood and Wilshire models of the same era, despite sharing many characteristics (especially the body and neck).